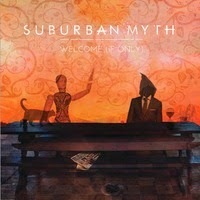 Suburban Myth is an alternative rock band out of Charleston, SC (vocalist Derek Daisey's home base of operations) and Nottingham, UK. ( the hometown of lyricist Phil Wormall). Rounded out by bassist Nicholas O’Kelley and drummer Nick Lomma the band draws their sound from both adult contemporary (Matchbox 20) and alternative rock (Goo Goo Dolls, Shinedown, etc.). The band's latest single, "Welcome (If Only)", which will be released July 28th (with the album of the same name following the single release on August 11th), follows in the footsteps of the band's debut EP, "Plastic Souls'' and has hit single written all over it! "Welcome (If Only)" features the same kind of captivating vocals that made Matchbox's Rob Thomas such a star in his own right and musically this melodic piece is the very definition of smooth rock! Custom-built for radio airplay, Suburban Myth have a winning formula going for them and they are holding onto a lottery ticket with the payoff of a lifetime! Look for this act to be in the spotlight within no time!